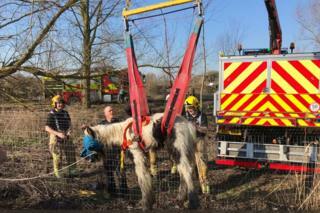 A nine-month-old foal has been rescued from a muddy river by fire crews. Trained animal rescue officers from Suffolk's fire service managed to winch the young horse from a muddy section of the River Gipping in Bramford, near Ipswich. The foal was sedated by an equine vet and blindfolded before being lifted from the river bank. Three crews from Ipswich working alongside a vet were called out at 09:23 GMT on Sunday to help the animal. The fire service said the foal was taken away by its owner in a horse box.